A person who observes nature can witness the fact that animals instinctively use earth to cure themselves. Indeed, we owe much of our discovery in this field to animals. There is a sea resort in the Siberian forests of the Oussouri where the discovery of the curative properties of the earth was the result of observations of wounded animals, wild pigs, roe-deer, red deer and other animals who came to wallow in the benefactory mud. Dr. Em. Grommier has told the story of the elephant "Fil," who, with his kindred, purged himself with silicic-magnesic clay-marls and daubed himself with mud. The French Army used it recently for veterinary purposes - when horses were afflicted with hoof gangrene, they were put in a stable, the floor of which had been dug up and kept wet so that the horses could kick in the mud. The animals went instinctively to the clay-mud where they found a remedy for their disease. Animals seem to know instinctively the usefulness of contact with clay when they are ill or wounded. Those living wild to not hesitate to dip the affected area in mud. Domestic animals, too, turn to clay. A cat that is abscessed, wounded or ill will lie on a clay case (a large bin of clay covered with a cloth). Even when not ill, she will prefer this bed to one more comfortable. Domestic and farm animals can be treated with clay. The method of treatment is the same as for human patients, the only difficulty being in the docility of the animal in accepting the treatment. Farm animals can be persuaded to dip themselves into a mud bath prepared by digging a large enough hole filed with clay and water. 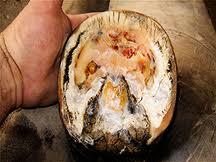 Cows have been cured of foot-and-mouth disease (apthous fever) with applications on the feet and daubs in the mouth. In certain countries, seriously ill animals are saved by daubing them completely with a mixture of clay and vinegar. Good results are also obtained by replacing vinegar with very salted water (sea salt). For internal use, clay is also effective. It can be added to the drinking water (4 soup spoons per quart of unboiled water) and even mixed with food. It can be used in the fur - particularly for cats, who constantly lick their fur, thus absorbing it easily. How very common to see animals, wild and domesticated, either eat or lick dirt. It is also common to see animals who would rather drink from a "dirty" muddy hole than from a bucket filled with clean water. Bentonite Clay is basically "dirt", but it is dirt with amazingly wonderful therapeutic properties. Animals are naturally drawn to "dirt" to treat themselves. It is instinctive. This is why it makes sense to give clay to animals. Animals know intuitively that it is beneficial. Bentonite clay, not only has many minerals and nutrients, but is also recognised to have therapeutic properties. Living Bentonite Clay is a therapeutic clay. There are clay licks in Peru that the parrots and macaus arrive at daily to feast on. A Czech study shown that bentonite clay added to pig slurry removed 98.9% of psychrophilic microorganisms and 100% of mesophilic microorganisms. Bentonite is also used in snake antivenom preparations. Basically....if they are able to, animals will happily eat clay if and when they feel the need to. It is one of their natural medicines. I have an insulin resistent horse who last year had his first laminitic episode since I've had him which was triggered by administering a worm paste. As a barefoot trimmer, I know a lot about laminitis and founder but this really caught me by surprise as I have always been very careful with his diet and of course his feet were in excellent condition but I recognised the signs of laminitis immediately. Whilst he looked fine in the paddock, as soon as I sat on him, my normally forward moving horse would not move. 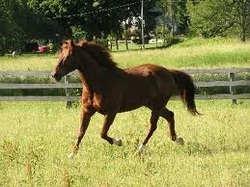 On the advice of an equine nutritionist/herbalist, I gave him Milk Thistle for detox along with Devils Claw which I used for about 5 days but my horse still presented with heat and strong pulses in his feet so I decided to look for another alternative. I stumbled upon an internet article that indicated that the use of Bentonite clay worked very well for this type of thing so I decided to give it a go. I tried to buy some from the USA but they didn’t ship to Australia and no equine suppliers sell it here so when I stumbled upon your website, I purchased some from you. Within 24 hours of starting the clay, the heat and strong pulses had left 3 of his 4 feet and by day 2 he had no heat in his feet. He had been unrideable for 3 weeks but I knew I needed to get his feet moving to get the blood circulating to help them heal so I put him in some padded boots and he started moving comfortably. After about 15 minutes I took the boots off and not only was he moving normally, he went like a rocket (I could barely stop him!) with no encouragement from me. I rode him again the next day for an hour but didn’t start him off in boots this time and same again. He was walking barefoot across gravel with no hesitation. There was still some room for improvement but once he was moving/rideable again, the blood circulating through his feet helped to flush out the toxins. I had my old horse back. Not only was I ecstatic but my horse looked pretty pleased with himself as well. It helped that his feet were already in good condition but I had read so much about this debilitating disease I was amazed I was able to turn it around so quickly. I was also working on a little mare recently who was having all sorts of problems, stocking up in the back legs, heavy sweating, girth lumps and behavioural issues. Based on her existing diet, I had a feeling that she may be suffering from protein overload together with some mild laminitis. She was given clay for 3 weeks after which all symptoms were gone. I then rode her out with her owner who was on another horse and she was usually agitated and dripping with sweat within 10 minutes of the start of the ride, we went out for an hour and a half and she moved beautifully and was so relaxed the owner couldn't believe it was the same horse - and she didn't sweat at all! Her other horse is a recent purchase and was suspected to have navicular syndrome and was also having problems with heavy sweating. So we also started him on a clay detox a couple of days before removing his shoes to help with the transition. The transition from shod to barefoot went very well and the owner reported he was tearing around the paddock only 3 days after his shoes came off, so a much better result than expected. Needless to say the owner was very pleased. Another excellent result from the clay. It is now something I recommend to a lot of my customers as a follow up to worming and vaccination and I generally recommend a clay detox twice a year to keep them healthy. I have recommended it for laminitic and foundered horses I have worked on with excellent results. A friend recommended it to someone who had a horse with stringhalt together with magnesium supplements and within 2 weeks the horse recovered from this debilatating disease. So I can highly recommend the use of bentonite clay for horses. Clay can be used in feed or as a slurry, however the most efficient way of using clay is clay water. 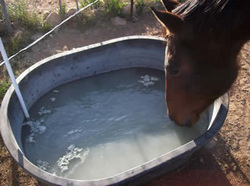 An easy way to offer clay to animals is to pour it in one trough or bucket at a rate of 1 kg of clay per 100 litres or 1% and let them access it as necessary. Always provide 2 water supplies....one with clay and another water supply with no clay in it. This gives the animals choice. They will drink clay only when they feel they need the benefits of the clay. If you are using an automatic trough, change the clay once a year. The water gets renewed as the animals drink from it. If you are using using a bucket where the water is stagnant, change the clay approximately once a week based on the temperature/weather. As it gets hotter, change the clay more often as it will become stale. 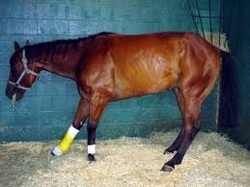 I was asked to look at a horse about 5 months ago, an off the track Thoroughbred who was crippled due to very damaged feet. X-rays confirmed he had rotated pedal bones in both front feet (foundered). His long time farrier had suggested euthanasia was the kindest option for him so I took over his care in October last year. First thing I did was take him of bute and put him in therapy boots to keep him comfortable, a clay detox for 3 weeks and a new diet. I also performed some soft tissue body work on him as he healed. 4 months later I watched him canter up the paddock to get his breakfast, he was now paddock sound. Another month later I arrived to see him walking across the gravel driveway without a problem (he wouldn’t go near it 5 months ago). 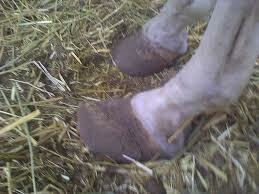 His feet are looking great, another couple of months and all the old damaged hoof wall will be gone for good J. Another happy customer. Use plastic or wooden implements with clay. Do not use metallic utensils with clay as they negate its actions. Stir and let it sit for 24 hours. When ready, pour the clay water (not the clay deposited at the bottom) into the animal feed. Bentonite Clay should be used for 3 weeks on, one week off. Repeat if necessary - but no more than 3 times. And remember....always seek advice from a vet when an animal is sick. 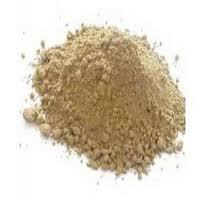 Bentonite clay is a big part of my detox program now. I have used it for symptoms of laminitis and founder with excellent results and I have also recommended it to others. It is important to only use good quality clay though as there are some cheaper alternatives on the market which should be avoided. One friend reported to me that she recommended it to someone else for a horse with stringhalt along with extra doses of magnesium and the horse recovered very quickly from this debilitating disease. For my own experience, when my Stock horse came down with laminitis for the first time since I’d had him after administering a chemical wormer, which caught me completely by surprise, I got him onto a clay detox straight away and within 1-2 days, the acute stage subsided (heat and strong pulses had completely disappeared) and he was rideable again within a week and did a 5 hour ride some 5 weeks later completely sound so excellent result with no veterinary intervention and no drugs. I now recommend a clay detox twice a year to my customers for about 2 weeks in mid spring and mid autumn to help them through the high sugar seasons.